Poor Bryan Adams. 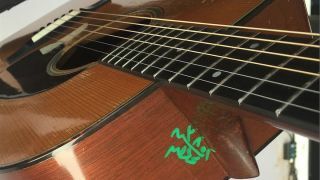 While the veteran Canadian singer-songwriter tours the globe in support of new album Get Up, his guitar has had a nasty run-in with Egyptian Customs and a green marker pen - reckless handling, indeed. "Airport customs graffiti on my 1957 Martin D-18 from Egypt," said Adams on Instagram. "Back to the luthier..."
Fortunately, the damage isn't irreparable, as the guitarist explained later on Facebook: "It will be fixed no problem. I want you all to know that I love your country and we had an amazing time there, we felt at home. "The incident of defacing our instruments at airport customs is annoying, but it needed to be said. Much love to you all and look forward to bringing my family to visit you one day soon....next time no green markers please!" Tragically, this isn't the first time this has happened to Mr Adams - back in July 2015, a similar incident occurred with Air Canada (below). Still, bet these were all flights to remember, eh?